A 28-year-old man, Okwuchukwu Ibekwe, has been arrested by the Lagos State Police Command for allegedly selling his five-month-old son to a child trafficking syndicate in Anambra State for N400,000. Ibekwe and his wife had on December 17, 2015, contacted one Chinelo for the transaction. Ibekwe, who lives on Shinaba Street had some difficulties in his trade and decided with his wife to raise some money by selling the baby. The syndicate, through a woman, identified only as Chinelo, who stayed in Ihiala, Anambra State, paid the Ibekwes N400, 000. Ibekwe was said to have received N250, 000 as the father of the child, while the mother received N150, 000. Trouble reportedly started when Ibekwe had a quarrel with his wife after returning from his trip to Anambra where he sold his baby. It was gathered that when he refused to give the wife her share, she reported the matter to the police and absconded. Ibekwe was subsequently arrested and detained at the Police Gender Unit, Ikeja, while police operatives also arrested Chinelo’s husband in Anambra State. The baby and Chinelo had yet to be found. 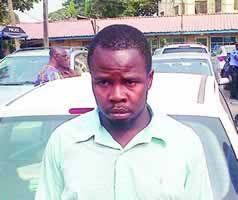 Owoseni said, “The suspect is assisting the police with information to recover the baby. While being paraded, Ibekwe said he collected N400,000 from Chinelo in exchange for his son with the full knowledge of his wife. He said, “Chinelo was to give me N400, 000 for the baby. My wife was the one who suggested that we dispose of the baby to meet our business needs. “But Chinelo gave me N250, 000 for the baby when I went to deliver him to her in Anambra State. “When I returned, my wife and I quarrelled and she ran away for three days. I did not know that she went to report the matter to the police. She was concerned with her own share of N150, 000. “I sell vehicle spare parts in Ladipo market. “It was a lawyer who called me that my wife had reported me to the police, and that I should come and see her. When I went there, I was arrested. “I do not know the whereabouts of my son. I did not know Chinelo would run away with my child,” Ibekwe added.